VINTAGE COSTUME ANTIQUE JEWELRY MATCHING JEWELRY SETS - PARURES! 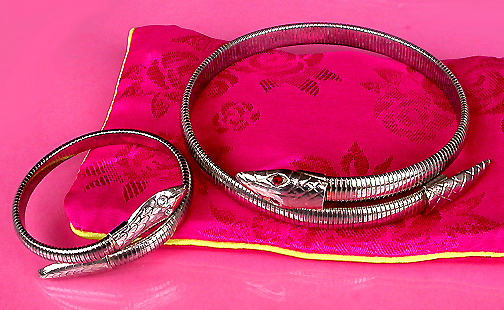 Art Deco Sterling Silver Vintage Estate Antique Snake Coil Necklace And Bracelet Jewelry Set - Parure. 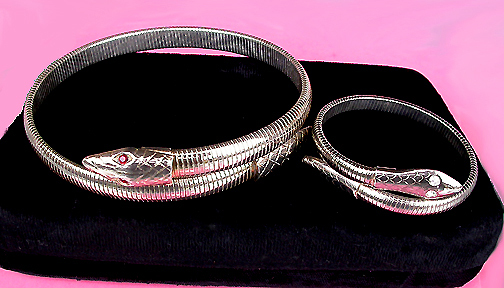 Item #S168288 - Art Deco Sterling Silver Vintage Estate Antique Snake Coil Necklace And Bracelet Jewelry Set - Parure. Size: Coil necklace and bracelet fit any adult neck and wrist size. 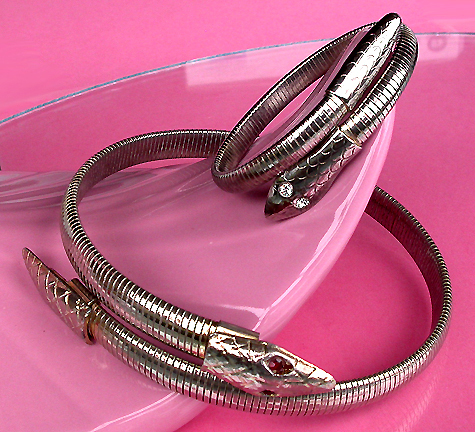 Exotic gleaming sterling silver Art Deco coil snake necklace and bracelet have snake coil bodies! 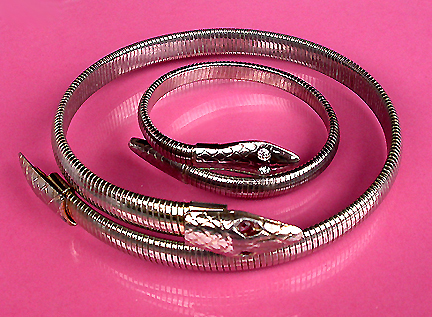 The snake head on necklace has ruby red crystal eyes and clear crystal eyes on bracelet. Head and tail have wonderful engraving. Though not marked, this antique jewelry set is tested positive for sterling silver. Some old sterling silver pieces are not marked. Coil has lots of elasticity for lasting enjoyment, in rare excellent vintage condition. A fabulous matching Jewelry set to wear at weddings, prom nights, pageants, parties, cruises and special functions! US$268.00.